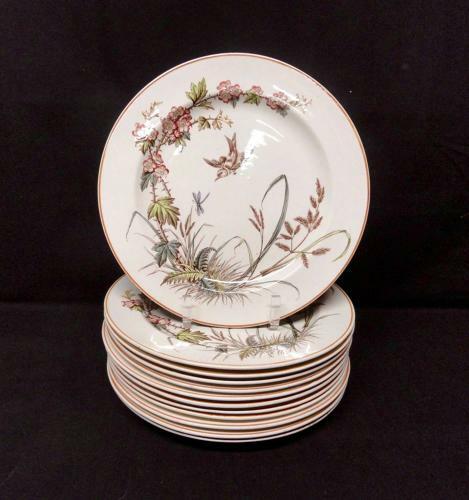 These Victorian 10 3/8 " plates are transfer printed in brown and further enhanced in wonderful hand coloring in shades of cherry pink, gold, indigo blue and green, spectacular coloring. The pattern features an exquisite songbird watching a dragonfly dancing above the exotic, transfer printed foliage. Wild rose flowering canes and wonderful geometric designs along the rim complete this wonderful pattern. Made for John Mortlock retailer, London England. Condition is great. Clean shiny and bright with no chips, no cracks and no repairs.